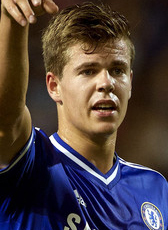 In July 2013, Vitesse hot prospect Marco van Ginkel moved abroad. English giants Chelsea signed the talented midfielder and Dutch international on a 5-year contract with a transfer fee around the 5 M€. After a season with injuries and minimal play, he moved to Italy to play for AC Milan on the loan season 2014-15. His career continued on a loan deal at Stoke City until June 2016. The loan deal at Stoke City ended when Van Ginkel moved to PSV at the 1st of February 2016 for the rest of the season. Van Ginkel scored at his return in the Dutch Eredivisie against FC Utrecht on the 7th February 2016. At the end of his loan period, he became champions in the Dutch league and he was an important part of the success. His future at his club Chelsea was uncertain. He suffered again from injuries and played a few matches in the first half of the 2016-17 season. In January 2017, he returned to PSV for another loan period for the rest of the season. His loan period was extended in the 2017-18 season after a contract extension until 2020 at Chelsea. His second loan season was again successful. As captain of theEindhoven team he won the Dutch League. At the end of the season he became injured again and a long recovery time is expected. Van Ginkel returned to London.